Living in the Olmec civilization, the major influence on all aspects of life was religion. This played a particularly large role in the political organization of the civilization, intertwining with politics to be the main driving and organizing force of the civilization. The ruling elite of the Olmec civilization was centered on the priests and wealthier families, and as power became more centralized, the central political rule became concentrated on shaman-kings. These kings were believed to have divine powers, and performed the rituals that were an integral part of their lifestyle and religion. This highly religious society often justified the rule of these shaman-kings. As divine creatures, they could exercise absolute rule over their people because they had been chosen by the gods. The ruling elite were housed in cities, which served as the center of political organization. Cities centered around raised temple mounds, where religious ceremonies took place. The main public building projects established by the government were these pyramids, as well as platform mounds (also for religious ceremonies) and stone roads. 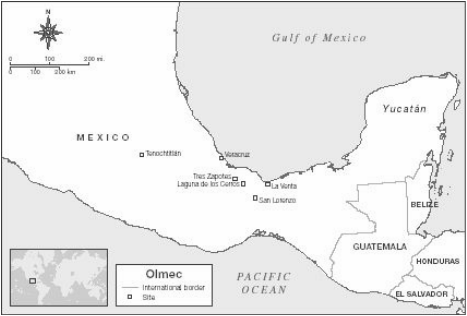 Major cities included La Venta, San Lorenzo, and Tres Zapotes, which all served as important, powerful cities at different times throughout the Olmec civilization.